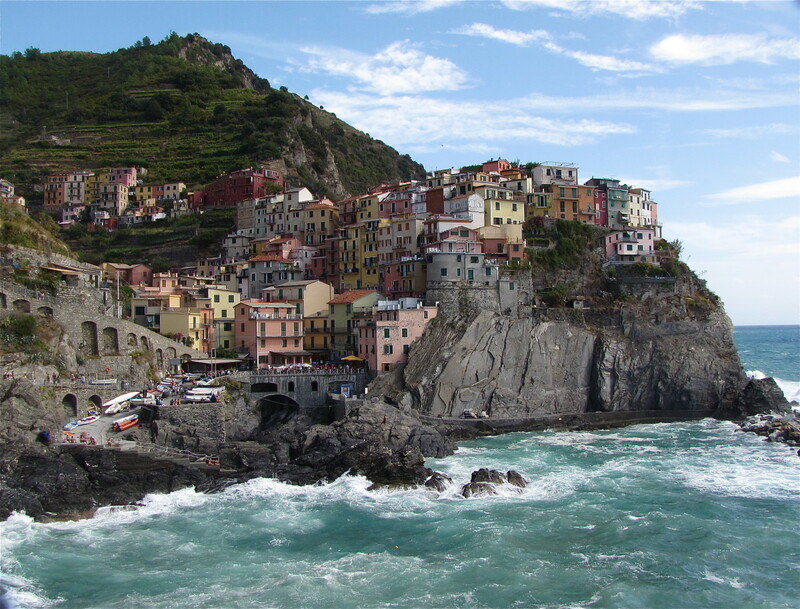 If you are heading to the Cinque Terre region of Italy, you may be interested in a wonderful, relatively unknown gem, located just south of the world-famous (and now extremely crowded) villages. 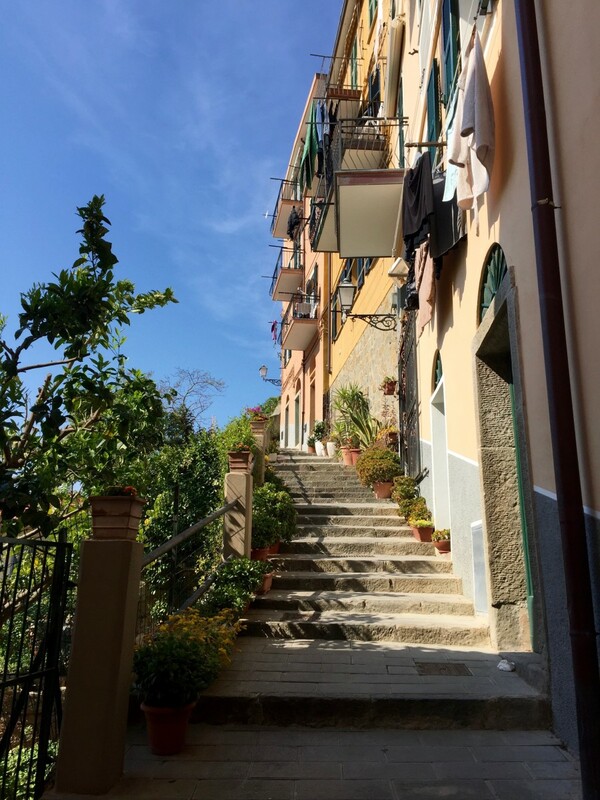 We stumbled upon Porto Venere on a recent visit to the Cinque Terre and immediately fell in love with this quiet and picturesque fishing village on the Ligurian coast. Exactly how we made it to Porto Venere was pure happenstance. Wanting to see the Cinque Terre villages from the sea for a different perspective, we purchased the one-day ferry pass. While checking out the ferry schedule, we noticed that in addition to stopping at four of the five villages, the ferry also visited a place we were not familiar with—Porto Venere. So, we hopped aboard the ferry in Vernazza, our home for the week, and headed south along the coast. Having already explored Manarola and Riomaggiore, we decided to stay on the ferry all the way to Porto Venere. We figured if it looked interesting we would get off and explore, if not we would simply ride the ferry back from whence we came. 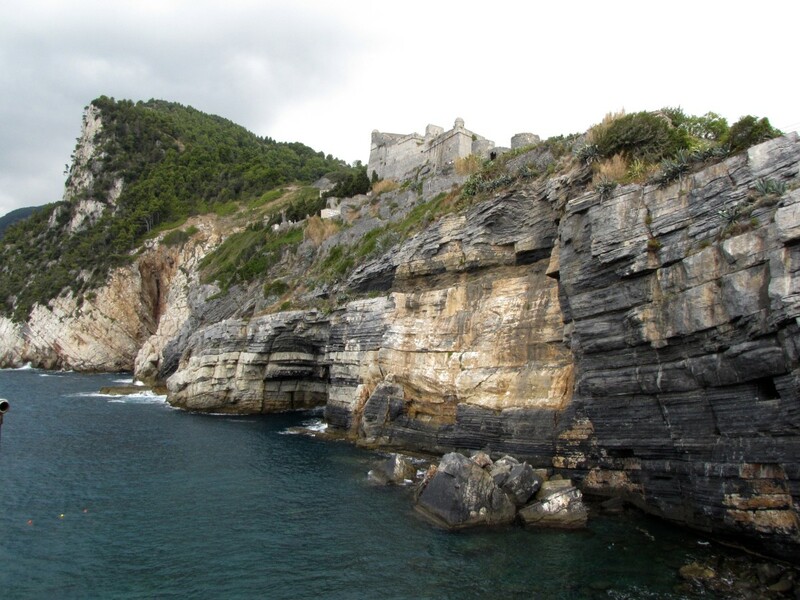 The stretch of coast between Riomaggiore and Porto Venere is a rugged, and extremely scenic stretch of coastline. 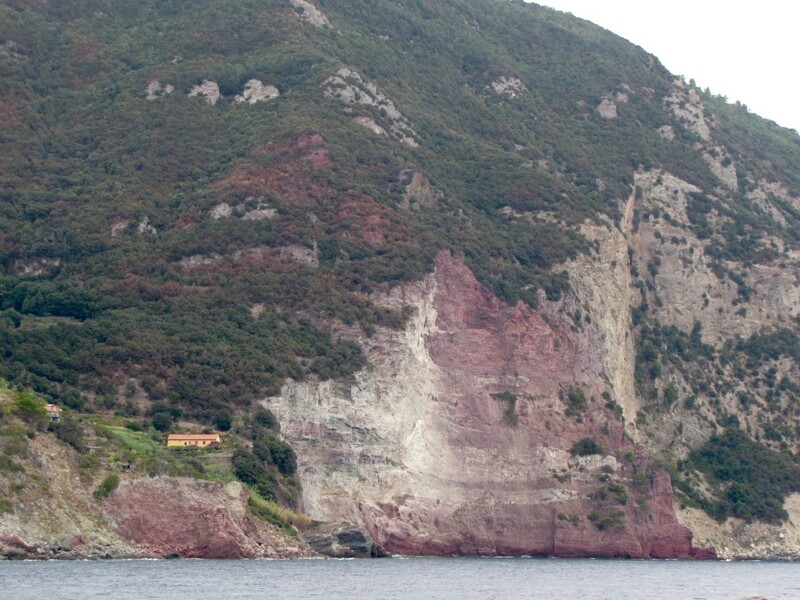 Just prior to arriving in Porto Venere you will pass an area where the color of the rock is a beautiful red, almost as if someone had painted the landscape to draw your attention. A few minutes later, as we approached our destination, we were in awe of the ancient church sitting prominently on a rocky cliff overlooking the sea. Above the church, a fortress, perfectly placed overlooking Porto Venere and protecting the harbor. We immediately knew at that moment that we would be spending the afternoon exploring Porto Venere and its treasures. 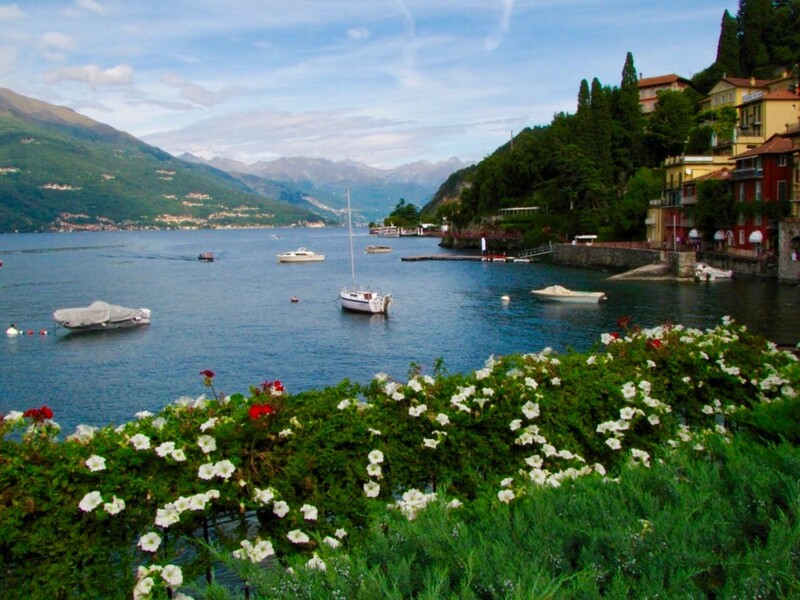 Unbeknownst to many, Porto Venere along with Lerici and a few surrounding islands are located on the Gulf of La Spezia, otherwise known as the “Bay of Poets”. Sought out by many a famous poet and author in the 18th century, including English poet Lord Bryon, this idyllic seaside community became much sought after for its inspirational landscape and beautiful bay. As you motor into the small harbor of Porto Venere your attention will be drawn away from the Church of San Pietro to the colorful buildings, known as the Palazzata, that line the harbor front. The buildings, many of which are small shops with private residences above them reach upward for six to seven stories and form a formidable defense for the town. 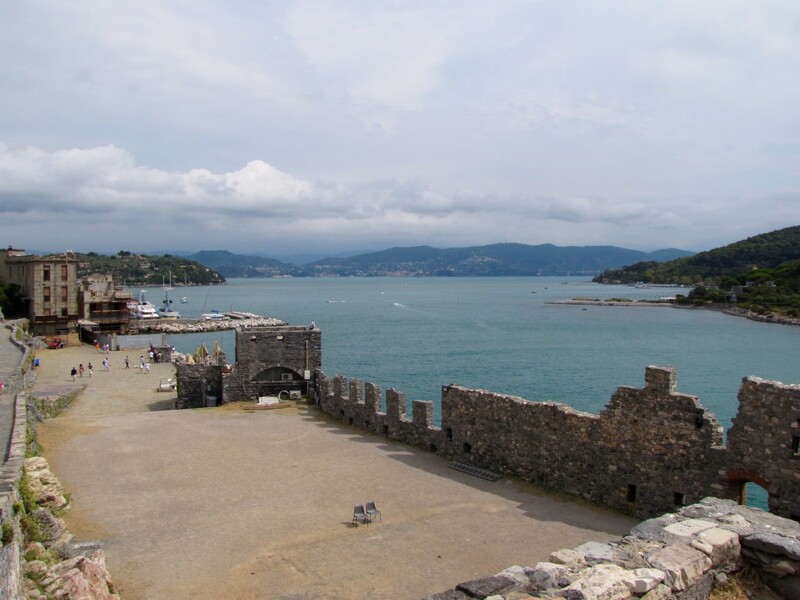 As you disembark the ferry a quiet waterfront piazza greets visitors arriving via the sea, and leads you to the city gate and the historical center of Porto Venere. Your first observation here may be that this narrow road, the via capellini, and the only one through town, is much less crowded than the villages of the Cinque Terre. Certainly a welcome relief. 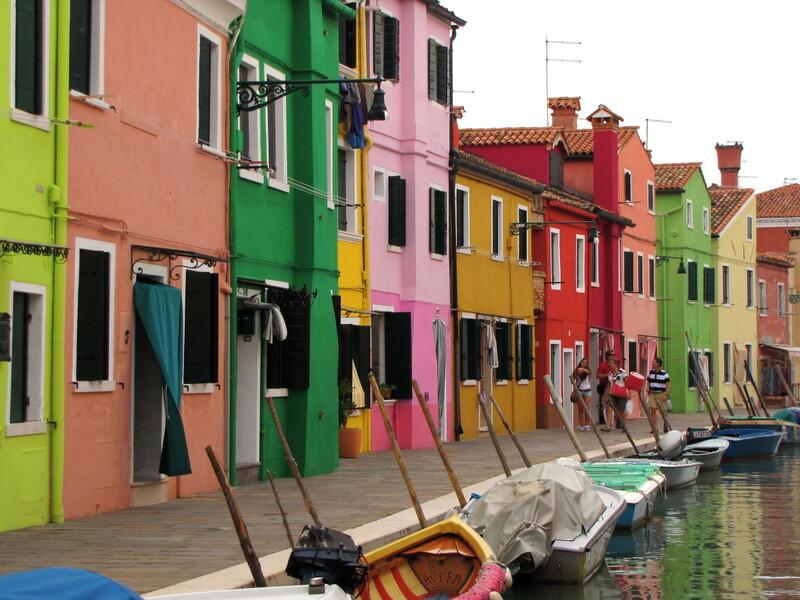 You can actually stroll the town center with ease without rubbing elbows and fighting crowds. As you make your way through town you are heading straight toward what just might be the highlight of your visit, the Church of San Pietro. 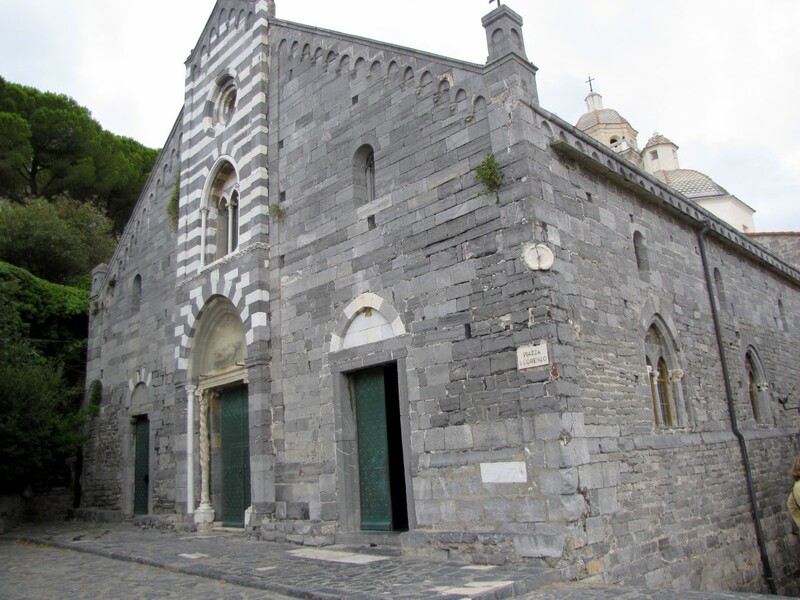 As you leave the historical center of town, you will come to the long ramp leading up to the Church of San Pietro. 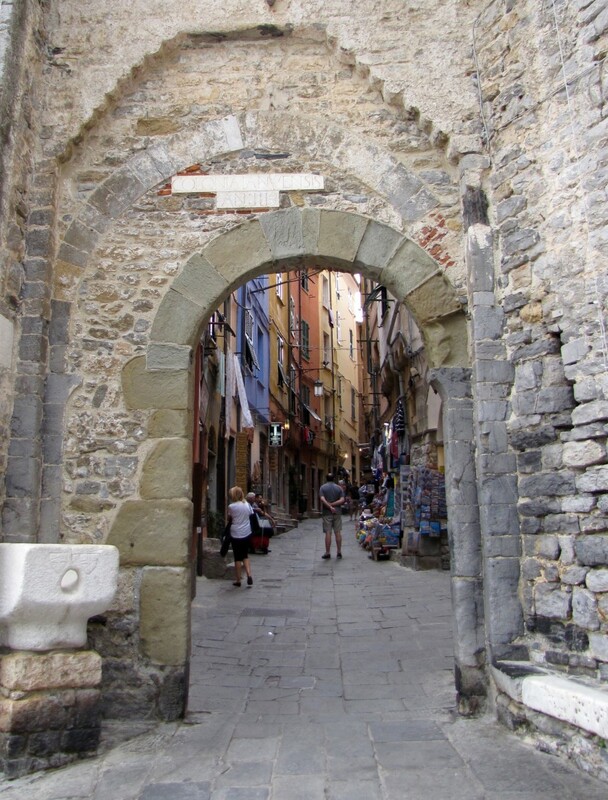 In Porto Venere they like to say that all roads lead to the San Pietro, and this is basically quite true as the only road through town inevitably deposits you at the doorstep of this centuries old church. Consecrated in 1198, and modified extensively over the centuries the church was actually built over the ruins of a fifth century Christian church and an ancient pagan temple. 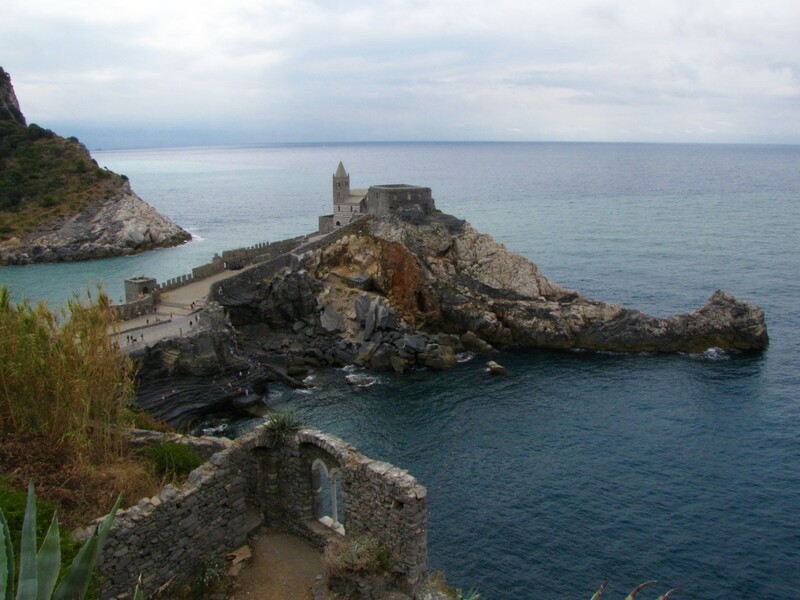 Today, the church is the defining landmark of Porto Venere and offers stunning views against the blue Ligurian Sea. As you walk the pathway up to the church take note of the stone pieces that you are walking upon, some appear to have been cut from the red rocky coast that you passed on the ferry into Porto Venere. 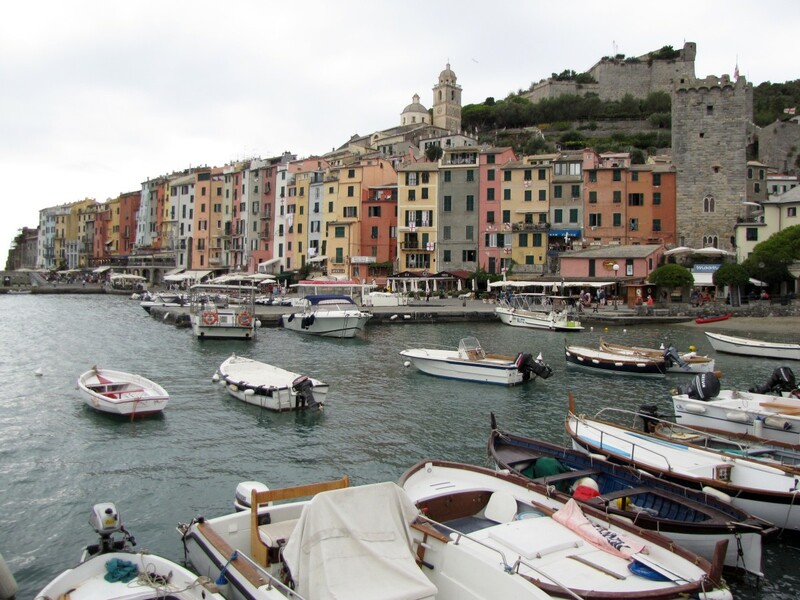 Porto Venere can be found with two different spellings, Porto Venere and Portovenere. According to Wikipedia, the spelling was Portovenere until 1991 when it was changed to Porto Venere. The church itself is small and simple, and will take but a few minutes to explore. The altar is to the left as you enter and behind it is a small opening to a balcony with views of the sea. The entrance to the church is through two large bronze doors with a number of interesting figures greeting visitors. This is such a stunning setting that it is a very popular venue for wedding photos and such. On your way to or from the church be sure to take notice of the Lord Bryan Grotto. A steep, narrow stone stairway will take you down to the rocky shore and lead you to the Grotto, which actually collapsed years ago, but remains popular with visitors and locals alike. On our visit we watched as a younger generation enjoyed jumping off of the very large boulders into the sea. 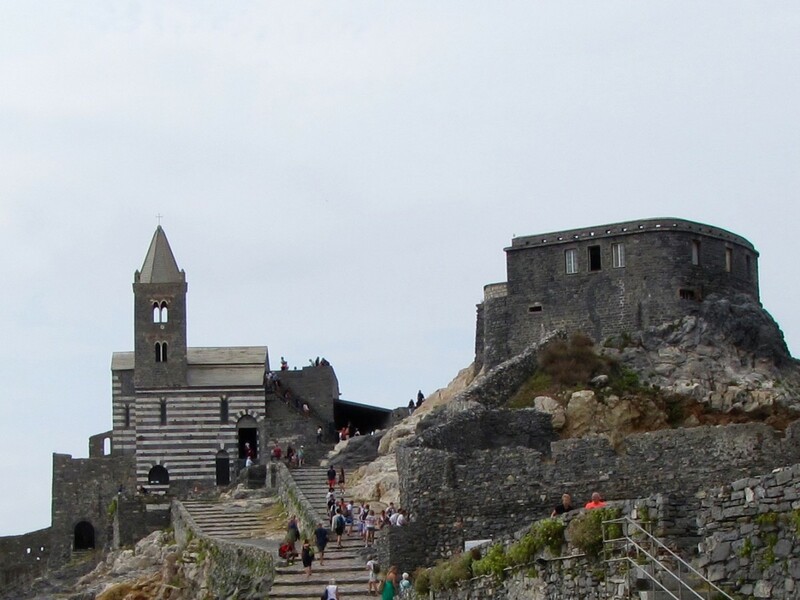 From the church you can now trek up to the Andrea Doria Castle. Perched high above Porto Venere, the castle was constructed in the twelfth century by the Genoese to protect the harbor. Today, it’s a popular tourist attraction and from this high vantage point you will get your best photos looking down on the Church of San Pietro. It’s an absolutely beautiful setting, definitely worth the climb, and affords great views of the town and harbor. While up here explore the cemetery, which in Italy is always an interesting past time. The castle is open daily from 10:30am to 1:30pm and 2:30pm to 6:30pm and there is a small five euro fee to enter. 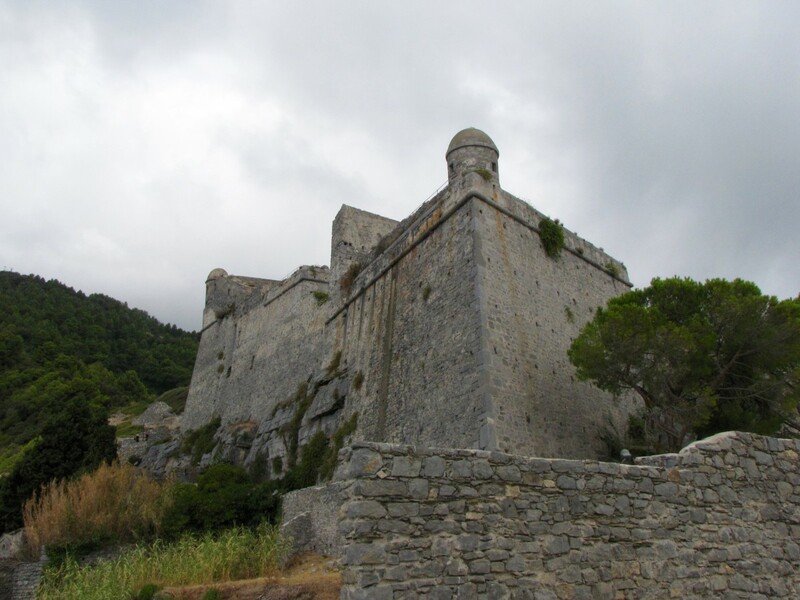 Also of note and worth a stop on your way back to town is the Church of San Lorenzo, built in the twelfth century, and located on the hill above Porto Venere and just below the castle. The interior of the Church of San Lorenzo stands in stark contrast to the sparse interior of San Pietro as it contains numerous artistic pieces and marble sculptures. On our visit to Porto Venere we spent the better part of the afternoon exploring this quaint and historic village. 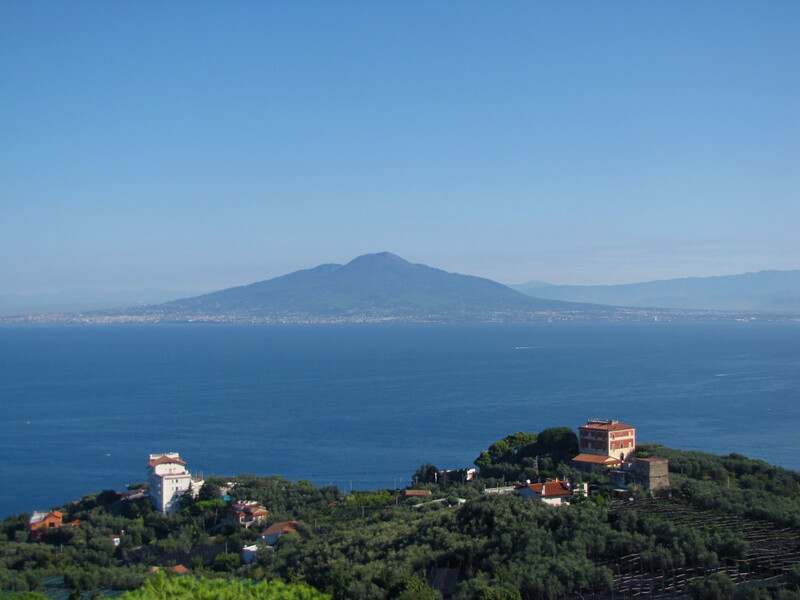 If you visit be sure to allow plenty of time to get up to San Pietro and the Doria Castle in addition to exploring the historic center of town. As we worked our way back through Porto Venere we stopped for a great lunch at La Piazzeta, a small restaurant with outdoor seating. There are a number of other interesting cafes and trattoria’s to choose from on the via capellini, so you should have no trouble finding a place to eat. Back at the waterfront you may want to spend a few minutes to explore the harbor. Between the small, locally owned shops and the array of different boats in the harbor it makes for an interesting stroll. As we headed back to the dock to wait for our ferry back to Vernazza I think we were all in agreement that Porto Venere was an amazing find. This small coastal village manages to remain somewhat remote due to the fact that there is no train service here. You can drive to Porto Venere, but parking would appear to be limited, or you can take a bus or taxi from La Spezia. 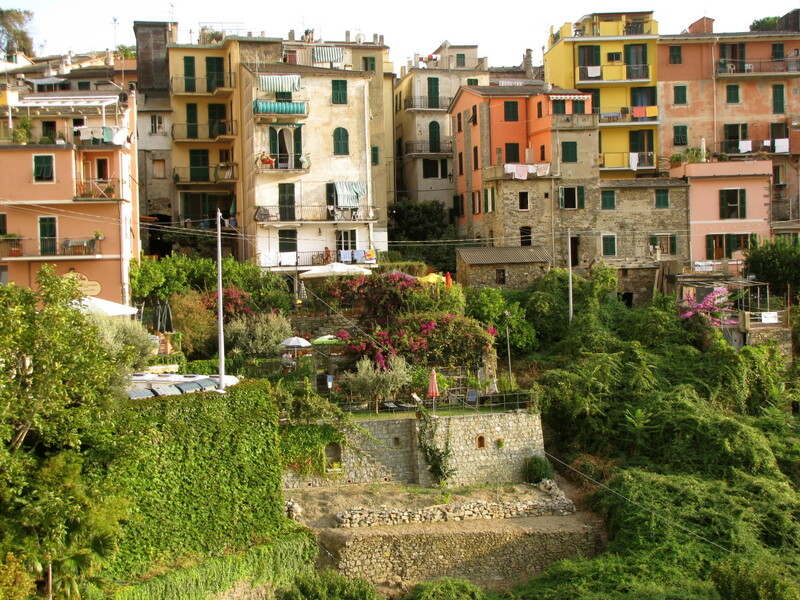 Many visitors simply do as we did and take the ferry for a day trip from the Cinque Terre. 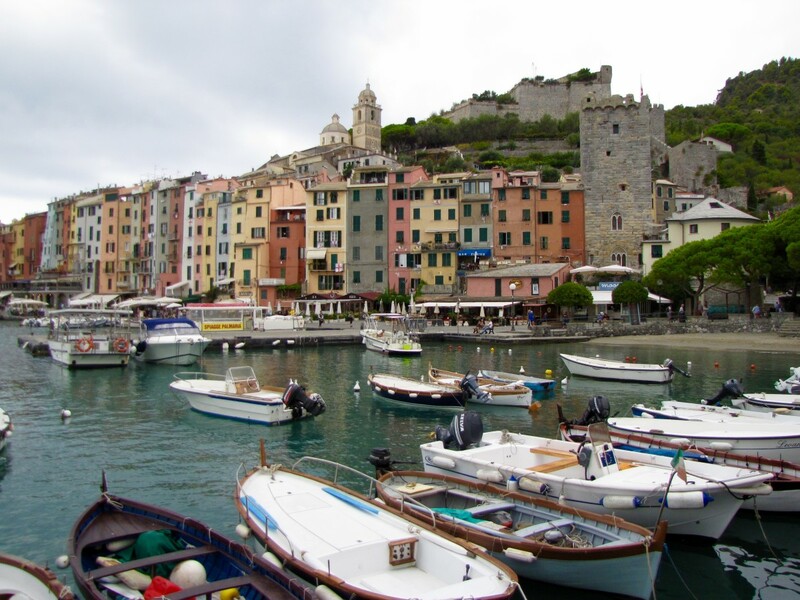 The fact that it is not overly easy to get here has helped Porto Venere retain its quaint charm, and prevented it from being overrun with tourists for the time being. If you are visiting the Cinque Terre, and your time affords a day trip, I highly recommend taking the ferry and exploring Porto Venere—you will not be disappointed. Hi Vladimir. Thank you. What an amazing place. And to think we had no plans to visit Porto Venere and didn’t even know it was there. That’s what I love about traveling, the unexpected surprises. Thanks again, have a great day. Indeed, one doesn't have to be a poet to be poetically inspired by this place. As a born-European with a heart for historical sceneries, I get deeply nostalgically touched by localities like Porto Venere. Thank you for sharing. Thank you Peggy. One of the things we really joyed about Porto Venere was that is was not overly crowded. It made for a relaxing, stress free visit. And, it’s a beautiful place. Glad you enjoyed the tour. What a fabulous looking place! I can certainly understand why it has been designated a UNESCO site. It is nice that at the current time it is not overrun with tourists. Your photos were wonderful and I particularly liked the ending of that quote by Lord Byron..."I love not Man the less, but Nature more." Thank you Linda. We have been very fortunate to be able to visit some of these places. Porto Venere was beautiful and a pleasant surprise. Have a great day. This looks like another interesting place to visit. You certainly have some wonderful travel experiences! Thank you Flourish. We were very lucky to find Porto Venere. We could have easily opted to stay in the CT for the day and hiked or done a number of other things. It really was a beautiful place. Absolutely stunning! How lucky you were to find this gem. I would love to visit. Hi Linda. Thank you. 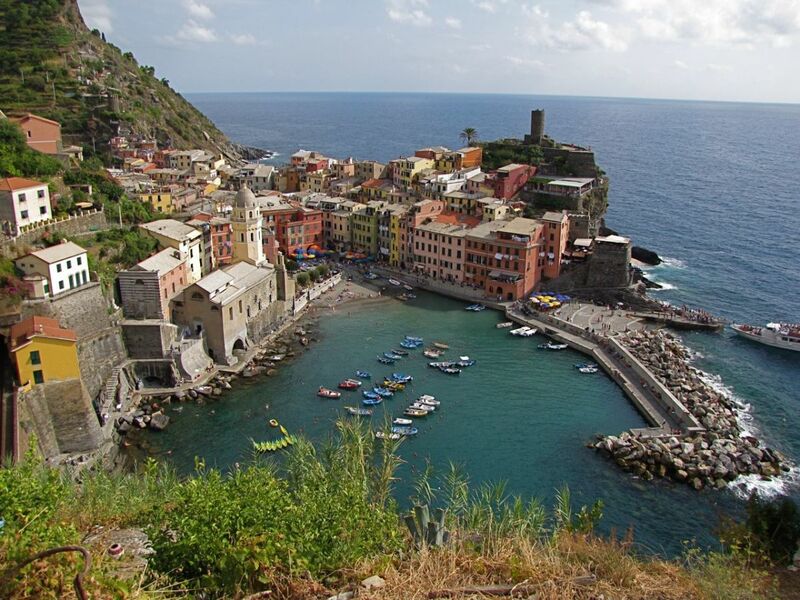 We spent 5 nights in Vernazza and just loved it. It gave us plenty of time to hike, explore the CT villages, and make our way to Porto Venere, which was a very pleasant surprise. I think you would love PV, I know we did. Thanks again, have a nice weekend. Bill, I LOVE Vernaza. And as a result of this hub, I think I might love this place even more. I've never been there, and you've got me wanting to go NOW. Wonderful photos and, as always, an enchanting writeup by you. Thank you for sharing with all of us. Thank you Heidi. 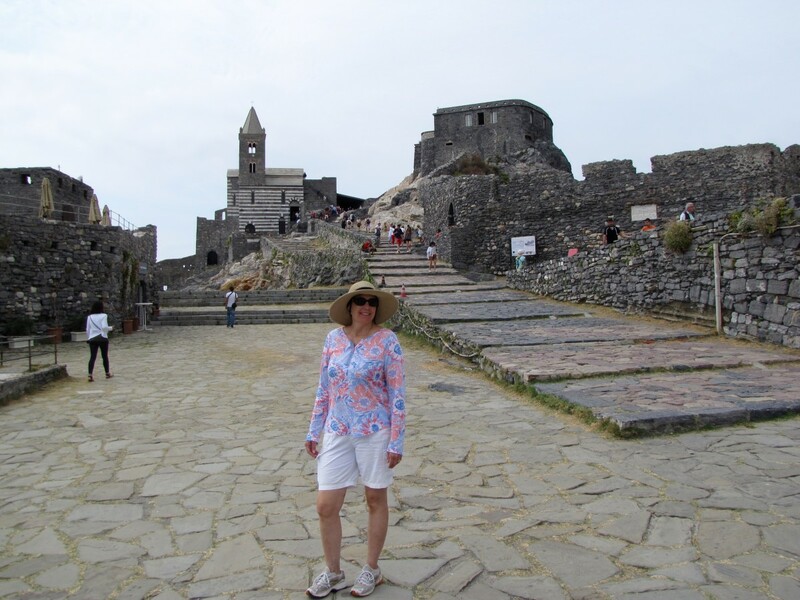 We really had not planned on visiting Porto Venere but really enjoyed our day there. It’s a beautiful place and the pictures just don’t do it justice. Have a great day. Thank you Joanne. 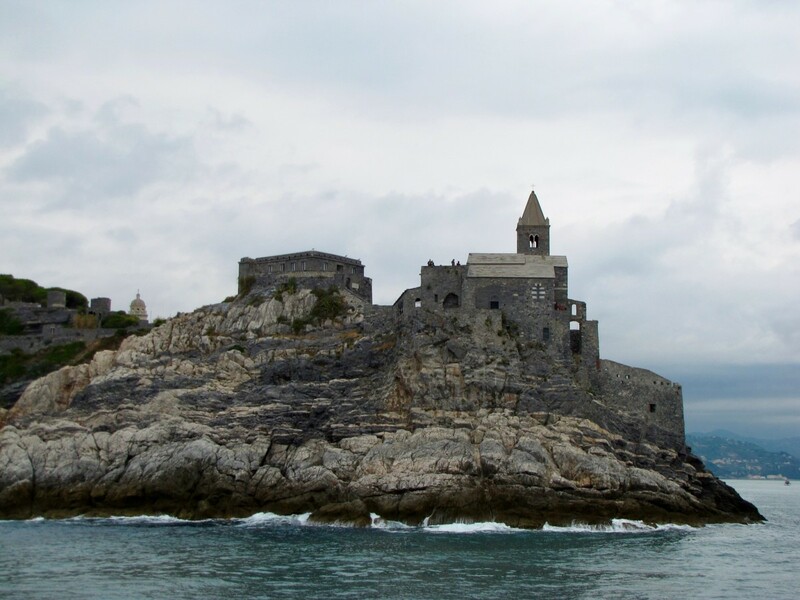 I think we were all in agreement that visiting Porto Venere was a wonderful day and a pleasant surprise. And to think it wasn’t even on our radar. I never even knew this area existed! 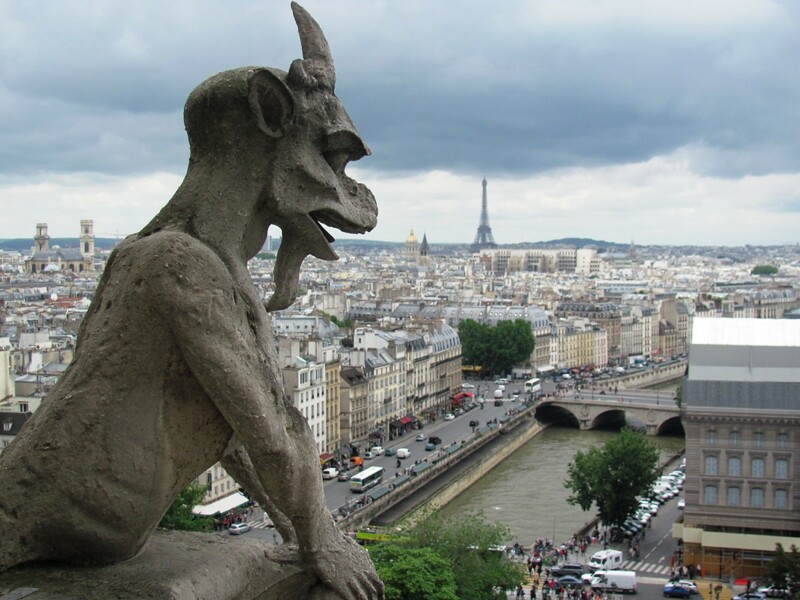 It looks like a place I'd love to see if I ever get to Europe. At least until I do, I can see your amazing photos (as always). Thanks for sharing your travel and talent again with us! Another great article Bill. You accurately captured the beauty of Porto Venere with your detailed descriptions, photos and history of this fabulous find. I especially like the photo looking down at San Pietro from the castle and the quote from Lord Bryon!